The Lady Blazers hold a 16-7 record, ranking fourth in the Gulf South Conference. Crystal Townsend is a late bloomer to the game of basketball. Ranking No. 9 in the Gulf South Conference in rebounds with 7.4 and 11 points per game, Townsend got her start in high school. Townsend graduated from Cape Coral High School in Cape Coral, Florida, where she was a key piece in leading her team to a 24-6 overall record, averaging 14.1 points, 8.2 rebounds and 2.5 steals per game. Growing up, Townsend was the only athlete in her family. It wasn’t until she reached high school that she gained interest in the popular sport. It was pure instinct that drove her closer to her athletic gifts. “I was really blessed with a talent that I happened to pick up on at the right moment,” Townsend said. Since high school, and transferring from Eastern Florida State, VSU has had an incredibly positive impact on Townsend and her game. Not only has it helped her game, but it has made her a better individual. 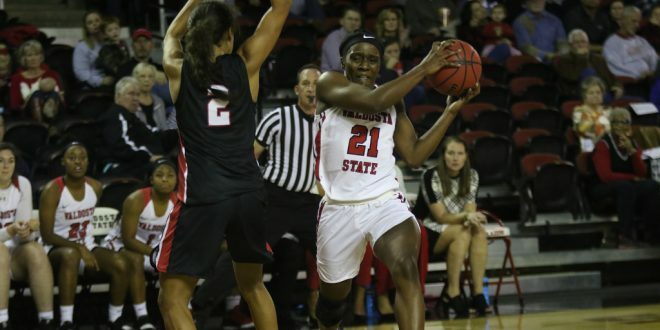 “Playing for VSU has helped me as a player and a person by teaching me to make playing ball for this university bigger than myself,” she said. From past experiences, she even thought of ending her basketball career. It wasn’t until she found VSU that she knew this was the game for her. Townsend hopes to gain more “rings and wins” in her basketball career. On the hardwood, she has learned many things that she hopes to incorporate in the future. Once she walks across the stage at graduation, Townsend plans on fulfilling her dreams beyond basketball. “After this season, I plan to hopefully travel overseas, take on my real estate license, and my end goal is to become a police officer,” she said. Her career plan after college is to stop crime, just as she stops offensive players on the hardwood. Written by Sarah Clark, Staff Writer. Photo by VSU Athletics.